Contemporaries who gazed upon Washington seemed to see more than a man. Descriptions of him bordered on mythical. His head, said an observer, was well shaped . . . gracefully poised on a superb neck, with a large and straight nose, blue grey penetrating eyes, high cheek bones, and a large mouth. Abigail Adams, wife of John Adams, turned to the poetry of John Dryden to describe Washington: Hes a temple Sacred by birth, and built by hands divine. Sacred, divinethe words evoked the nations feelings about this man. They saw in his stern, yet engaging, face, reflections of inner virtues. It was a German-language newspaper that gave him his lasting title: Des Landes Vater, the Father of His Country. While many men in America wore wigs before the Revolutionary War, this practice began to go out of style after 1776. By the time Gilbert Stuart painted this portrait in 1796, Washingtons habit of powdering his own natural hair would have fit the fashion of the day. He tied his hair in a queue, which was sometimes worn in a small black silk bag. 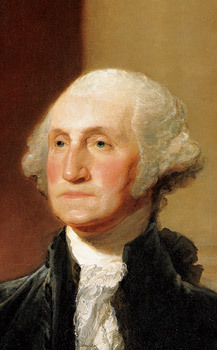 His painful, ill-fitting dentures made Washingtons mouth bulge out; he clamped his lips to hold them in. Supposedly he lost his teeth by cracking Brazil nuts between his jaws. By the time he became President, he had only one tooth left. One set of dentures was carved from hippopotamus tusk and had a space to accommodate the single tooth. This caused almost constant pain, which he tried to ease with laudanum. After Stuart painted his first portrait of Washington, probably in 1794-95, Martha Washington asked to have her own portrait done, as well as another one of the President. Intended for Mount Vernon after Washingtons retirement, the portraits are known as the Athenaeum portraits because the Boston Athenaeum acquired them after Stuarts death. In these portraits, Washington faces left, and Martha faces slightly to the right, so the pair would be balanced. Stuart admired the sculpture of Washington by French artist Jean-Antoine Houdon, probably because it was based on a life mask and therefore extremely accurate. Stuart explained, When I painted him, he had just had a set of false teeth inserted, which accounts for the constrained expression so noticeable about the mouth and lower part of the face. Houdons bust does not suffer from this defect. I wanted him as he looked at that time. Stuart preferred the Athenaeum pose and, except for the gaze, used the same pose for the Lansdowne painting.